If you’re searching for a great value, high quality individual or pack of four hole eye plate with ring, then look no further than our brilliant range. 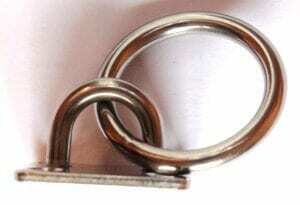 A Four hole eye plate with ring is designed for use in securing chains, wire and rope to a range of different types of walls, floors and posts. Ideal for use commercially, domestically and in the marine industry, they’re incredibly versatile too. Plus, they’re great for use with fibre rope in demarcation for car parks, queues and segregating off different areas of land too. Made of non-rust high grade steel, each of the four corners comes with a hole ready drilled which makes screwing them into virtually any surface very easy indeed. The eye itself come with a ring attached which the rope then goes on to with a clip. Not quite sure if a four hole eye plate fitted with ring will really do the job? 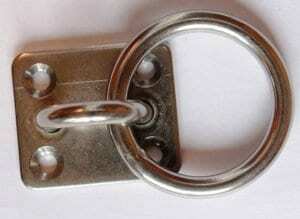 Then view our range of snap hooks and lifting shackles as well. Plus we have a large variety of wire rope to use with your plate too. Here at Rope Services Direct, we are pleased to offer a large selection of four hole eye plates. Call us now on 01384 78004 and/or complete our contact form to place an order or to raise questions. Four Hole Eye Plate With Ring Overall rating: 5 out of 5 based on 6 reviews.